In today’s post, we continue the theme of water paints. It’s time for gouaches after watercolors and ink. Paints quite similar in the composition to watercolors, but slightly different from it. It is worth getting to know these differences before we choose media for specific projects. So we’re getting to the topic. At the beginning, a pinch of history to explain what gouache really is. It is one of the oldest painting techniques, having its origins in the Middle Ages, however, gaining popularity only at the turn of the seventeenth and eighteenth centuries. Currently, gouaches are most often associated with paints popularly known as posters. This is an erroneous term because the posters are devoid of solid white and chalk. The word “gouache” itself comes from the Italian language and simply means dew or moisture (guazzo). At the beginning, gouaches were used as mullets in oil painting. In the Middle Ages, manuscripts were decorated with them, but the paints themselves did not have the name used today. Their composition is more closely related to tempera or watercolors – it is a suspension of pigment in water with the addition of gum arabic as a thickener (binder). However, the element that distinguishes gouache from eg. watercolors is chalk or white (zinc or lead), which makes the paint have a much greater coverage. When painting with these paints, we must remember that they are water-borne even after drying. It’s worth finishing your work with varnish to avoid unwanted blurring, which is relatively easy. When they dry out, gouaches create a lighter coating and become dull, which must also be taken into account when painting. We do not apply paint directly from the tube, because the dry gouache becomes brittle or flaky. 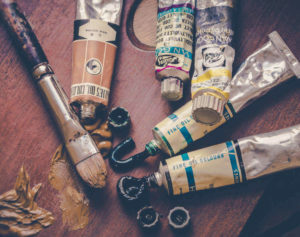 The drying time is also much shorter, so if you intend to work longer on a given image element, it is better to cover the substrate in advance – just like with watercolors. Gouache is also suitable for learning painting, mainly due to its low price and the possibility of overcoating. However, remember not to do it repeatedly, because the ready work can start to crack and crumble. Gouaches are not as demanding as watercolors. 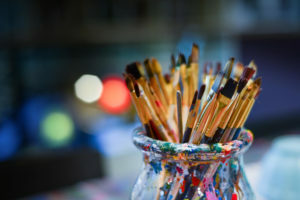 It is easier to apply – they have a thick, sticky consistency, so it is not necessary to have very good brushes or the right specialist paper. We can paint on many surfaces: paper, cardboard, parchment or canvas. They can also be spread using an airbrush. An additional advantage when using gouaches is the ease of combining techniques; e.g. with watercolors, pastels, acrylics. Gouaches were used once to make illustrations for books, posters, and hand-made fashion projects, but today their place was taken mainly by computer illustrations. I encourage you to try your hand in this painting technique. Or maybe you already have some experience with these paints and would you like to share it? In any case, I encourage you to leave comments or questions under the post. Until next week!